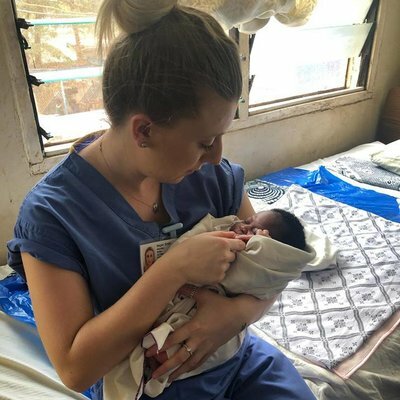 I have just returned from my three week midwifery elective placement in Ghana. I have enjoyed every second of the trip and it has been a once in a lifetime experience for me. The placements organised by the staff are tailored to what you want to get out of them. During our placement, we were able to spend time in different healthcare settings which meant we got the most out of the experience which was really beneficial. The first week was spent at a district hospital, about a 5 minute taxi journey from the Work the Wolrd house. It is a small maternity hospital with 12 labouring beds in a room and one delivery bed in a separate room at the end. During our time there we observed many deliveries, and the differences in practice between Ghana and the UK started to become evident. All women labour in the labour room on beds no more than one metre apart, then are then made to walk to the delivery room once the presenting part is visible. They all deliver in the lithotomy position, primps have an episiotomy early on, too soon to tell if they actually need one and all without analgesia. The third stages are all actively managed and when they have been wiped down. They walk back to their beds where the baby is waiting for them. The hospital staff are very friendly and really make an effort to include you in the day to day running of the labour ward; they are good at answering questions and equally want to find out about how maternity care is performed in the UK. Also at this hospital are antenatal and postnatal wards as well as antenatal clinics and a theatre. Dr Anderson is very welcoming and let us observe his ward round of these areas, teaching as he went. We were shocked how similar the guidelines for care are to what we are used to, even down to the drugs administered. However, there was a bigger focus on malaria in pregnancy which was interesting for us to witness although we did notice the lack of malaria nets or any other protection from future bites. During our week we got to know how the hospital is run and got an introduction to Ghanaian midwifery and it was a valuable experience! We thoroughly enjoyed our time there! Our second week was spent at a regional hospital. 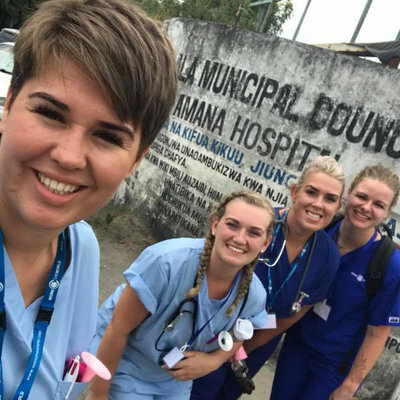 This is the main hospital in the area, where the majority of the Work The World placements are based so it was nice to walk around and see friendly faces of the people you live with! The layout and format of delivery was the same as at the first placement, only there seemed to be fewer beds. The Antenatal clinic there is bigger than at the district hospital and the separate booths made it more private for the women, although the midwife would happily see two or three women at the same time, all with different problems or concerns. 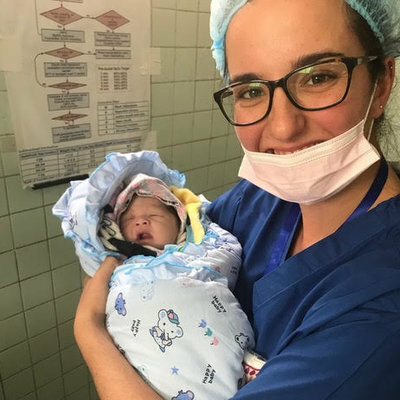 During this week, the differences in healthcare delivery (compared to the UK) became very apparent and we sadly saw some poor outcome deliveries which were hard to observe but valuable lessons nonetheless. The final week of placement was spent at a private hospital so treatment is covered by patients' insurance. This was personally my most enjoyable week due to how welcoming the staff were and how much we became part of the team. Whilst there, I was pushed to do certain things and when something interesting happened I was encouraged to follow the cases through to the end so I could see the outcome. The best shift this week was the night shift that I did. There was such a varied number of things to watch and I was kept busy for the whole 12 hours! While the labour ward was very interesting, it was the general medicine that fascinated me while here. Many of the cases that came through the A & E clinic were malaria cases of differing severity, but there were some interesting hypertension and renal failure cases to observe too. The doctor I was sitting in with was very good and explained everything to me once the patient had left the room, which was the most privacy I had seen since being in Ghana. I also managed to go out in the ambulance for a case, which was very different to anything I’d done at home. We made our donation of supplies and hats that people from home had written messages on for the babies at the end of the week. This hospital is friendly, small and specialised and the one where I learnt the most. It also meant I could get some exposure to more general cases, which - while not relevant to my midwifery course - was interesting for personal learning. I thoroughly enjoyed my three weeks placement in Takoradi, Ghana. One of the best things about my stay was being able to come home at the end of a shift and discuss my day with other housemates who had been in different departments. The varied placement areas and huge differences to home meant we were never short of stories to tell! While the mornings were spent at the hospitals, the afternoons were ours to do as we pleased and we made the most of them! There are lots of things to do in the local area, from the beach to busy markets and weekend travel is a must for anyone that comes to Ghana. There is a book of things to do at the Work the World house, which guarantees that there is never a dull moment! If I could have stayed another few weeks I would have done - it was the best experience I have had and cannot rate it highly enough!